You’ve undoubtedly been waiting with bated breath for the outcome of the apple tasting I wrote about two weeks ago. I know. Suspense can only keep so long. But if you’re curious, here’s what went down, and how. 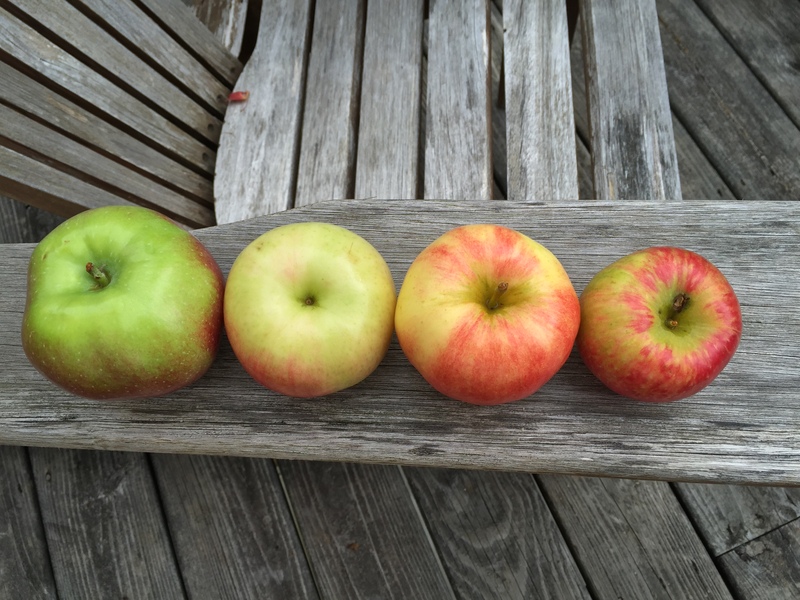 As you may recall, there were initially four, then five apples in our taste test: Macoun, Sansa, Honey Crisp, Zestar and a late entry, Cortland. We agreed on some kind of “blind” process. I proposed doing both a random numbering of the five apples and then a blind placement of slices of those apples on a plate. Jean Marie had a more streamlined idea that was just as good as far as keeping us guessing about what we were testing. Sigh. If only we had retained her list of which apples were which. Yes, I know. Pretty fundamental error. But after much discussion and some haggling, we found we were only unsure of two of the five choices. We figured we would resolve the mystery of the two apples after the tasting, and add a vote on what type of apple each of the contestants was as well. Time to taste! Joining us for the big showdown was our friend Stephen P. Kiernan (who I will most certainly tag in this post, thereby multiplying the number of hits tenfold), who stopped by between readings on his book tour for his new novel, The Hummingbird (http://www.harpercollins.com/9780062369543/the-hummingbird). Shameless plug. We passed the paper plate of apple slices around. There was a lot of nodding and chewing. Yummy sounds were made. Some of us took notes. (I won’t admit to that, however.) Finally, each of us listed his or her favorite, and the two runners-up. We conjectured aloud about which apple we thought we were choosing. Jeannie kept the tally. And the winner is. . . . Not so fast. In true contest protocol, the top THREE were Cortland, Honey Crisp, and Macoun. Not all of us had the top flight in the same order, and truly, there were all so good it didn’t take much for votes to start sliding around. And perhaps the collective memory of where we finally landed depends on whom you ask. I know. Science at its best. So let me say for myself, then, that when I go to the store now, my new apple quarry is the Honey Crisp. Both words apply so nicely. Crisp? The texture was the familiar crunch I remember from my best McIntosh samplings through the years—a sound like ice cracking on a Vermont pond in January. And Honey? Well, not too sweet. That I wouldn’t have preferred. But enjoyably sweet, no set-your-teeth-on-edge, no pucker-up, eyes watering, “Come on, Honey, try it! It’s great!” nonsense here. Not in the slightest. Purely enjoyable flavor. Great to munch on whole, and possible for a pie or torte. Try for yourself. Next time you’re here in Vermont, staying at Ridgeview, head down to Duttons and see what’s on display. Bring your own selection home. Next time, I’m going for the Baldwins.